Travel theme: Birds | Where's my backpack? After celebrating the king of all birds yesterday at the Wren Festival, I feel it only fair to give a nod to some other feathered friends, so here are a few fabulous birds I’ve spotted on my travels. 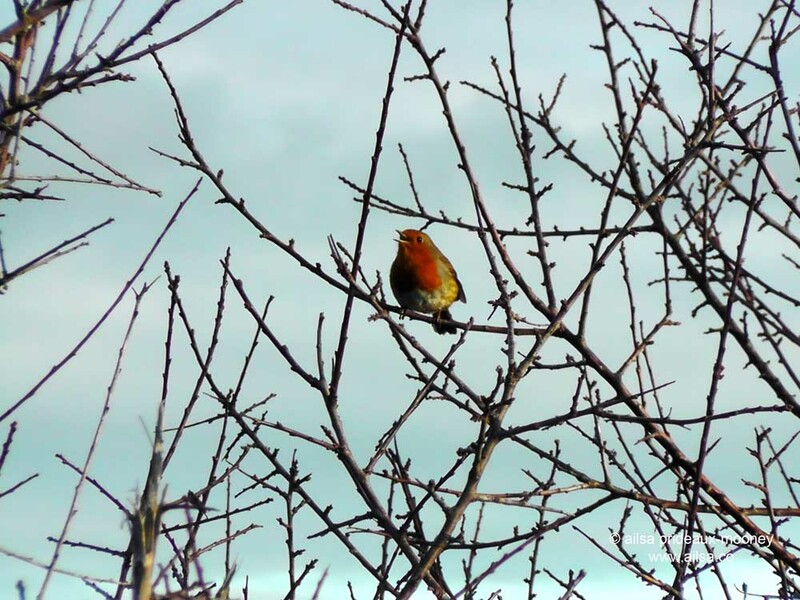 This chirpy little robin, a true harbinger of winter, followed me on a wintry hike around Howth Head. He was quite far off, but his song filled the air and his vibrant red feathers brightened up bare branches with a welcome flash of colour. Not at all chirpy and more than a little bit scary, this massive hawk swooped over my shoulder in Van Cortland Park in New York and ate a squirrel right in front of me. 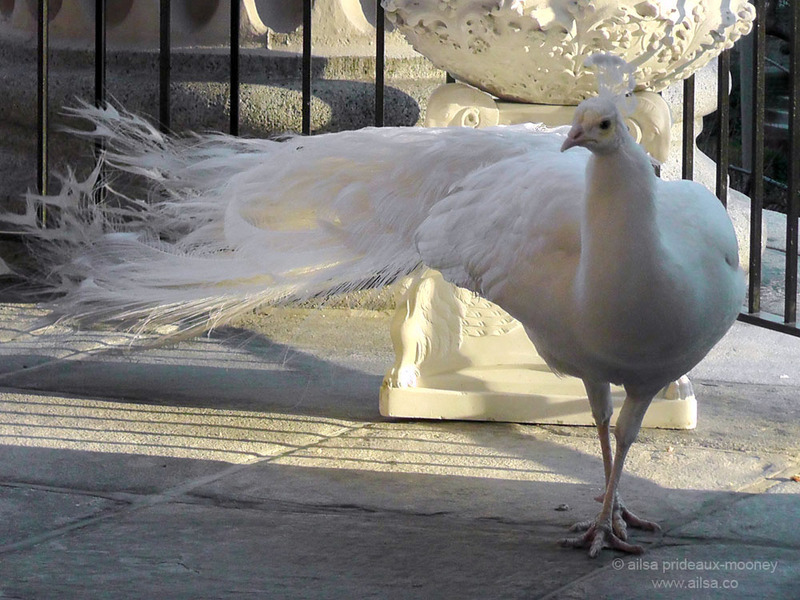 This dashing white peacock lives in the grounds of St. John the Divine in northern Manhattan and could be a contender for the title King of all Birds – he’s certainly got the outfit for the job. Finally, this little guy was a contender in the annual Georgetown Power Tool Drag Races in Seattle last year. He didn’t win the race, but he won my heart. Your hawk is magnificent, Ailsa! And that white peacock…like out of another world… Beautiful! make that twice! the laugh is infectious! Great theme again, Ailsa! That hawk is magnificent and the peacock wonderful…but the last one…special species?! Just marvellous! Oh, I forgot the robin, who always is my favourite! Me too, they’re filled with personality. There’s a big fluffy robin perched outside my window right now, I just gave him a little food to keep him warm on this frosty night. A good thing to do – I’m sure he will sing some extra for you in spring! Thank you very much Ailsa ! Galapagos are really wonderful ! Birds of prey are proud and fierce, yet beautiful. A great catch, Ailsa. And the peacock is very pretty. That last one made me grin. 😀 Thanks for another nice challenge! The peacock is my favorite! http://playamart.wordpress.com/2013/12/27/oh-to-be-a-bird/ how’s this for soon? for once i am not tardy and i am present for sure! checking out of the hotel now and then offline! glad i came up for air when your theme came through! Great Theme! I love birds. 12 years ago I owned 27 different species INDOORS. It became overwhelming. All of my photos of this time are on paper not digital sadly but I will watch and admire! I have ONE that I took in Lancaster County ! Hi Ailsa, Great robin. Birds everywhere and I hadn’t even noticed half of them. Here’s my set. Here’s mine – from my garden, Walsrode and Scarborough!